Family Inspirational Quotes – Please Share! Whatever your feelings towards family and life - be they good or bad - I'm sure you'll find a quotation or two to suit. "Acting is just a way of making a living; the family is life." 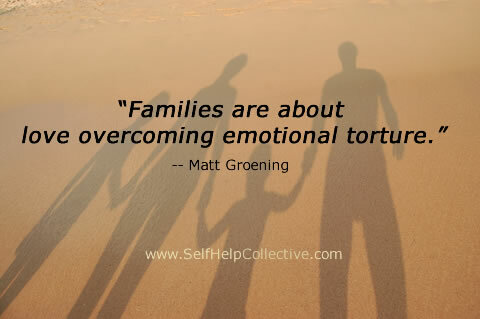 "Families are about love overcoming emotional torture." "Whatever they grow up to be, they are still our children, and the one most important of all the things we can give to them is unconditional love. Not a love that depends on anything at all except that they are our children." "There are times when parenthood seems nothing but feeding the mouth that bites you." "Some family trees bear an enormous crop of nuts." "Why do grandparents and grandchildren get along so well? They have the same enemy - the mother." "The first half of our life is ruined by our parents and the second half by our children." "A son is a son till he takes him a wife, a daughter is a daughter all of her life." "One of life's greatest mysteries is how the boy who wasn't good enough to marry your daughter can be the father of the smartest grandchild in the world." "My father always told me, 'Find a job you love and you'll never have to work a day in your life.'" "Govern a family as you would cook a small fish - very gently." "Honolulu, it's got everything. Sand for the children, sun for the wife, sharks for the wife's mother." Family Inspirational Quotes - What Next? Share this family inspirational quotes page - thanks!